I think that it could be hard for other toy companies to follow the uniform quality standards the Lego has. One reason being that Lego has been around for a very long time. A lot of toys are fads. Since they are gone so quickly, there would not be time to develop such uniform standards to their toys. Great post! As the commenter before me mentioned, it will be very difficult to compete with Lego because of its already established name. 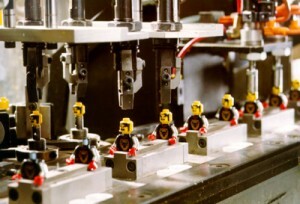 They were one of the first companies to establish these fun connectable blocks and they did it with high quality from the start. After more than half a decade of success, knockoff brands have no chance in terms of competition, as Lego keeps improving and changing with the modern times.